I am happy to report that I am Back! I took a few months off to concentrate on my coaching business and my primitive and country craft business. It has been extremely busy and I am loving the new road I have taken. Although it is fun, I truly missed doing my magazine. 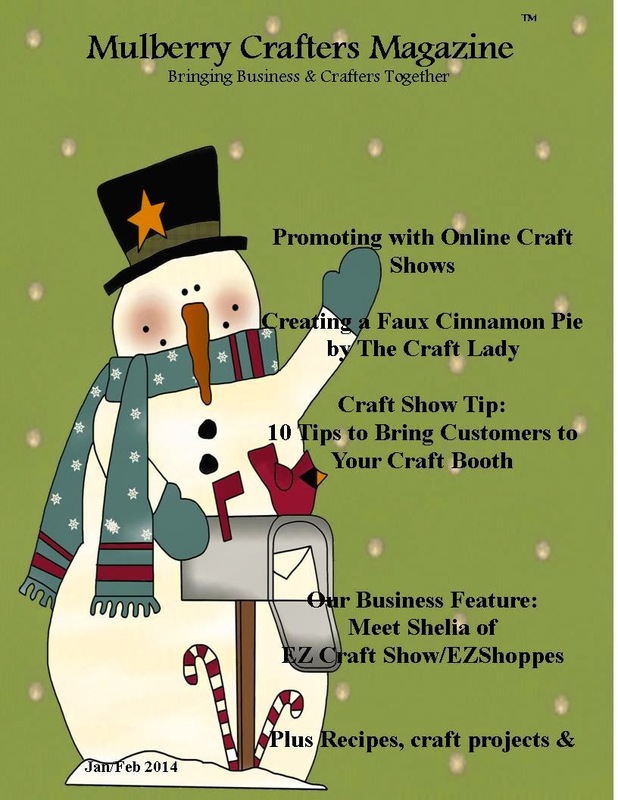 So I am bringing the magazine back with it's original name of Mulberry Crafters Magazine! I have so much to share with my readers and I can't wait to get started. In the meantime, please download the last issue we did just to refresh your memory. As the fall season begins im excited to start writing and adding new articles to the magazine. So im nearly done and would love to feature a lucky person in the issue. Its a full page ad to show off your work and tell alittle about you. if interested please leave a comment with your email address. Our 4th of July Issue is Ready! Happy New Year! Yes, I'm on the ball and made myself a list of goals to get my business on the right path. So to start, I've completed our Newest Issue of Mulberry Crafters Magazine for Jan/Feb. 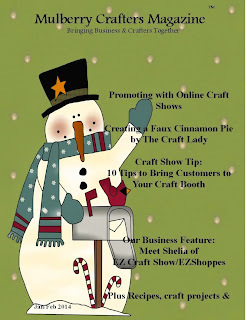 It's full of all sorts of tips for doing craft shows in the spring, Free Faux Apple Pie Recipe from the Craft Lady and much more. Our New Website is in the works too. I will update you when its ready! So while your waiting please grab yourself a FREE Copy today! Enjoy! I've been busy updating my magazine blog and adding some new things to it. 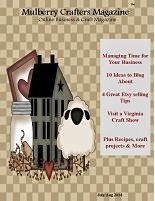 We added our archive issues of Mulberry Crafters Magazine. So if you missed an issue, visit our archive section and download your Free copy. You can also grab a FREE Pattern. Yep, our Button Eye Pete Pumpkin is ready for download. I will be adding new patterns again for the christmas holiday so please sign up for our newsletter and also follow me to be kept in form of our tutorials, craft show tips and more.